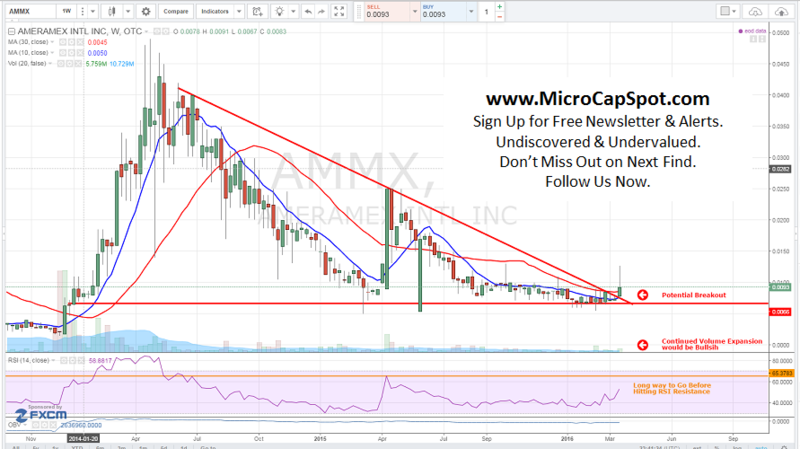 AMERAMEX INTL INC COM USD0.001 (OTCMKTS:AMMX) investors have reason to be excited with the recent developments and announcements at AMMX. The stock has gained 20% since the beginning of the week and advanced over 50% on the intra-weekly high. It is currently trading at $0.0094 on heavy trading volume over the last few days. The volume recently spiked to 1.9 million shares trading hands significantly higher than its average daily volume of 0.3 million shares. The company is on the verge of accelerated growth. AMMX plans to expand its product offering. It is expected that the company will sign a new dealership agreement for military equipment later this year. AMMX has been signing several agreements and purchase orders over the last few months. In recent developments, AMMX announced its full year 2015 financial performance and results. AMERAMEX INTL INC COM USD0.001 (OTCMKTS:AMMX) reported its 8th consecutive profitable quarter. Revenues climbed 13% from $7.3 million in 2014 to $8.3 million in 2015. Gross profit climbed from $3.6 million to $4 million. Net income surged 40% from $0.8 million in 2014 to $1.1 million in 2015. Cash and cash equivalents climbed $0.5 million compared to 2015 showing that the company’s balance sheet is relatively solid. AMMX sells, leases and rents heavy equipment to companies within four industries: construction (light and infrastructure), shipping logistics, mining and commercial farming. AmeraMex, with customers in the Americas, Africa, Asia and Eastern Europe, has over 30 years of experience in heavy equipment sales and service and inventories top-of-the-line equipment from manufacturers such as Taylor Machine Works Inc. and Terex Heavy Equipment. AMMX is currently trading at a $3.6 million market valuation. The company is currently trading less than a price to sales ratio of one. With its continued growth and 8th consecutive quarter of profitability this company should be trading at a much higher valuation. AMMX has been increasing sales and plans to expand its product offering. This exciting story is just beginning. We will be updating on AMMX when more details emerge so make sure you are subscribed to Microcapspot so you know what’s going on with AMMX. Disclosure: we hold no position in AMMX either long or short at the publication of this article and we have not been compensated for this article.